The Kruuse B Seen restores safety for dogs and their owners to walk at night, especially during the dark winter. The new B’Seen 360 lights up from all directions, no matter what direction the lamp turns. 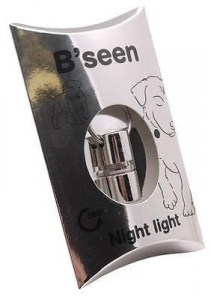 It allows the dog, the owner and children to become more visible in the dark. An added bonus is that the lamp has a modern design and is visually appealing! - B’Seen 360 lights up all the way round and offers maximum visibility in the dark.